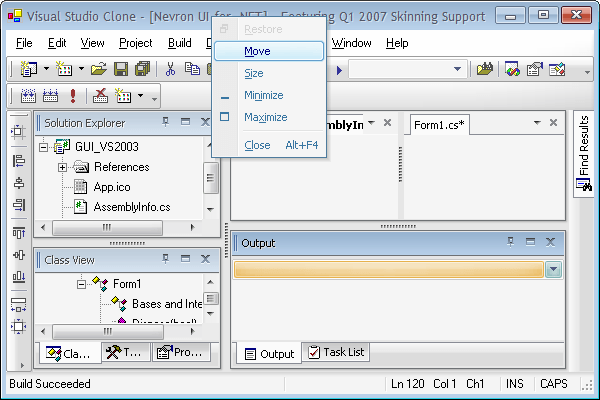 Nevron User Interface enables you to skin your application with just a few lines of code. 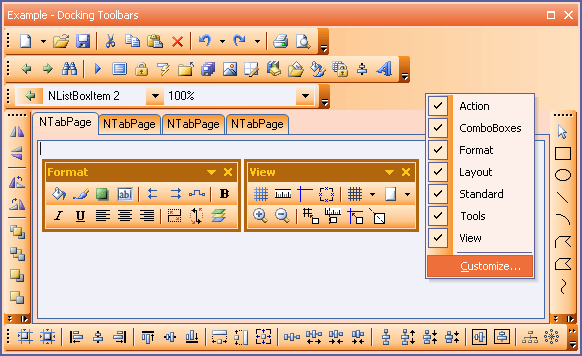 The suite comes along with five predefined skins including the famous "Vista", "MacOS", "Office 2007 Black", "Office 2007 Blue" and "Orange". Nevron User Interface comes with a powerful docking library which provides your applications with the latest GUI standards and technologies. These are tree-based, interface-structured hierarchies of predefined controls that can be docked, floated or redocked with visual feedback at run or design time. The unique layout system helps you model any complex structure in just a few lines of code. Nevron Docking Library comes with a powerful document management system which makes creation of tabbed or standard MDI interfaces a snap. Nevron User Interface provides you with distinguishable and stylish menus and toolbars, which are created entirely from scratch. All commands share a common object model, which makes it easy for a command to be visualized by any parent. The rich design-time support enables you to easily create modern MS Office 2003-like menus and toolbars with dock/undock capabilities. 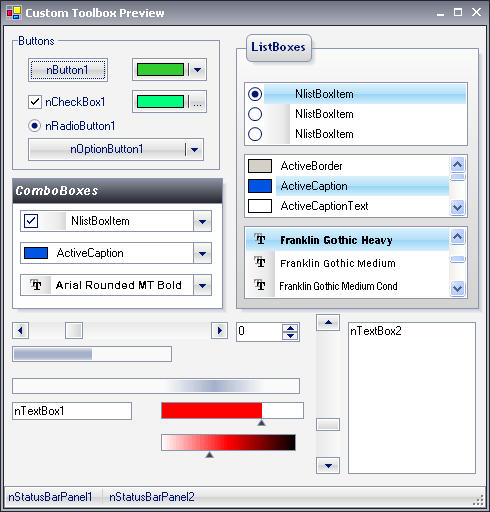 Nevron User Interface extends almost every control in the standard Windows Forms toolbox in order to give it stylish and consistent look-and-feel. The suite comes with a total of 70+ extended/custom controls - all fully extensible, customizable and with great appearance. By using these controls you can build Graphical User Interfaces with clean, consistent and professional look-and-feel. As a single developer working on niche market graphical printing applications, I could not afford to mess about getting the wrong UI component library to revamp our existing applications. I spent about 4 months evaluating various suits. I finally opted for Nevron, largely due to the excellent color, docking and command bar features, but also partly due to the fact that they have a real try-before-you-buy policy that let me completely test out their functionality before forking out my hard-earned cash. Nevron's class structure is very well considered and the various components fit seamlessly together. 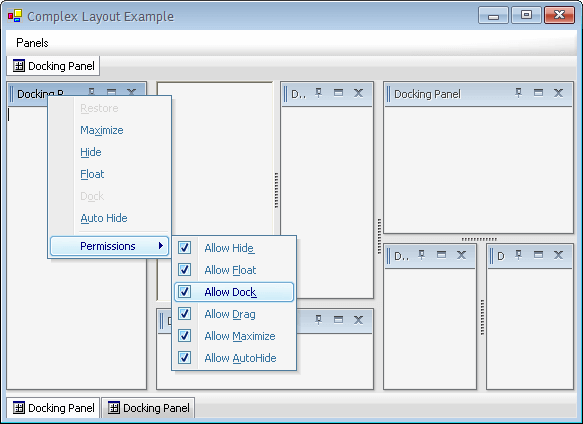 I especially like the commandbarmanager tool which makes developing docking / floating tools panels a breeze. Their docking controls are excellent and the 'docking hints' at run time certainly make using the software a lot easier - in our case, the user can have up to 13 editing tools on the screen at any one time (although most of the time, the smart user will tab these tools together to make working with them easier). 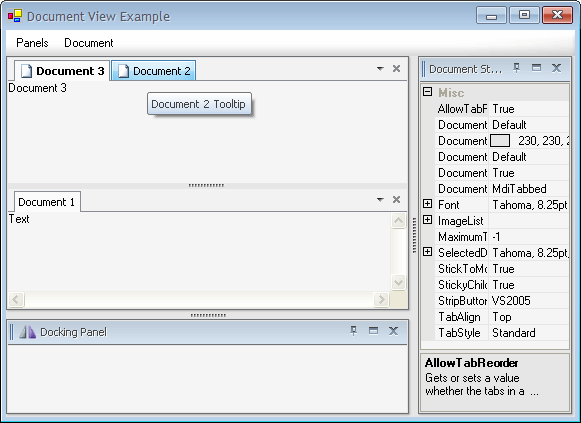 The latest version also includes custom forms, with some very pretty add-ons to regular forms and a nifty little font selector control than can be slotted onto a command bar or any other control. It took me all of 45min to add full text formatting feature on top of this control - such as font color picker, test alignment, font size, etc. but it's the impressive responses and help that have really set these guys above the pack in my opinion. In fact, this review is my way of saying thanks to the folks at Nevron for their outstanding support over the past few weeks. If you are looking for a good UI and docking library for .net, I strongly recommend you download a trial of Nevron and have a play.